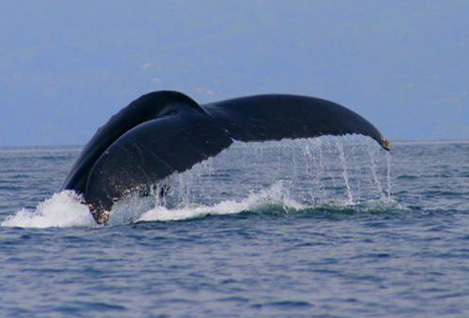 The Whale watching and Dolphin Encounter Tour, is the best option to see the most of the Marino Ballena National Park. The tour departs from Punta Uvita Beach and visits the famous Punta Uvita Whale Tale, Isla Ballena, Tres Hermanas Islets and Ventana sea caves. During the tour tourists search for humpback and pilot whales as well as spinner, bottle nose, and spotted dolphins, which are residents to the Uvita coast. When granted the opportunity, you might see and hear the humpback whales and observe the acrobatic displays of the dolphins. Also guide you to visit the coral and rock reefs to snorkel and observe the wonderful marine. Afterwards, the guide heads for the amazing natural sea caves of Ventanas beach, and if conditions permit the experienced captain will navigate the boat through the natural water passage to give you a spectacular interior view! Tour includes: Bilingual Naturalist Guide, water, snorkeling equipment, fruits, entrance fee.